The warm, open Bagdad Valley in Tasmania's southern midlands, thirty kilometres north of Hobart, became famous during early settlement for its bountiful apple orchards, stone fruits and pears. There is very little water in the valley and the area is frequently punished by summer droughts. Many orchards have failed over the years and the open grasslands were turned over to sheep grazing. 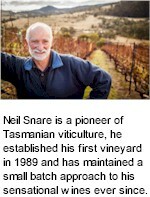 Neil acquired four hectares of the old Winstead Farm in Bagdad Valley during the 1980s, hand chosen as an ideal place for vines, dry grown, fertile and essentially frost free. The initial success of a small test patch of fifty plantings Pinot Noir was joined the following year by four thousand, ultimately a hectare and a half of Riesling and Pinot Noir. A further hectare and a half of Pinot Noir, Merlot and Sauvignon Blanc followed in 1993. The region often receives winter rains and summer droughts, a splendid ripening season often requires drip irrigation to sustain the vines through the summer heat and autumn dry. The well sheltered, inland location means that sea breezes do not arrive until late afternoon, allowing daytime temperatures to climb and remain high during the height of summer, an essential element considering that the growing season is a little shorter than many other Tasmanian vineyards due to the elevation. Winstead produce two editions of single vineyard Pinot Noir. Lot 7 is made from the original estate plantings on the home block, a robust wine, with dark chocolate, plum, tobacco and cinnamon characters. Lot 16 is from a slightly younger site, a little further up the hill, planted to the latest clones Pinot Noir to arrive in Bagdad Valley, Dijon 114 and 115. Lot 16 is more delicate with forest floor, strawberry and nutmeg characters, zippy and fresh, with a firm dry finish. Winstead's exquisite whites are made to European influences, enhancing texture and mouthfeel. The ferments are long and slow, as wines remain on lees for several months, adding gorgeous creaminess to their texture. Winstead's Sauvignon Blanc is richly barrel fermented to add marvelous complexity.